Make an Impact! Teach an Adult to Read & Write! Are you able to write a check, read a story to a child, or compose a short letter to a family member? Nearly 500,000 adults throughout San Diego County lack the skills to accomplish these basic tasks. You can help! 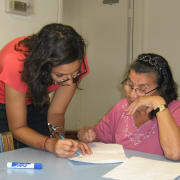 The San Diego County Library is seeking volunteer tutors to teach adults how to read and write in El Cajon, Casa de Oro, Spring Valley, La Mesa, and Rancho San Diego. Get involved, make a difference, and change a life! High school graduate, fluent English speaker, empathetic, patient & respectful.